I’m glad the Safety Pin movement is gaining popularity in the States. After Brexit, people started wearing a safety pin on their clothes as a sign that they were an ally to anyone who might feel oppressed. With Donald Trump winning the election this week, a lot of groups have voiced fears – LGBTQ, women, Muslims, immigrants, and racial minorities among them. 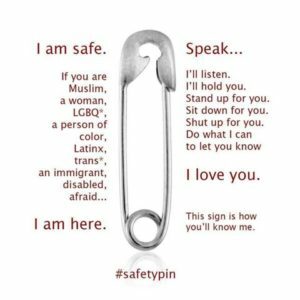 As a response, the Safety Pin movement has come across the pond as a way for people to let others know that they will help if you don’t feel safe. If you don’t feel safe out in public, I would be happy to stand with you, talk with you, walk with you, go with you to the restroom, and be a voice against prejudice, discrimination, and oppression. When I went out on my errands today, I stopped by Target to pick up a package of safety pins – the big ones. Anyone who has known me since college might be surprised that I’m joining Team Safety Pin. I love the cause, but I despise putting pins in my clothes . . . I mean really despise. It’s something I almost never do. I’m so adamant about it that I’ve gotten in trouble for not wearing my nametag within groups that require it. Sorry, but not putting a hole in my shirt is more important. So has the Safety Pin Movement convinced me it’s ok to risk my garments with pinholes? Not exactly. I put safety pins on my Ignite Phoenix zippy sweatshirt and my Scottevest hoodie. Before I go back East next month, I’ll put one of my winter coat. But for my regular shirts, I picked up a set of button magnets. Yes, it works. 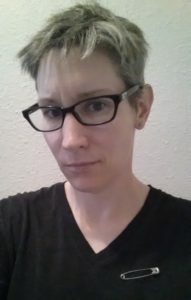 I have a safety pin magnetically attached to my shirt as I type.